New Orleans artist and rabble-rouser Jonah Bascle faces his mortality. 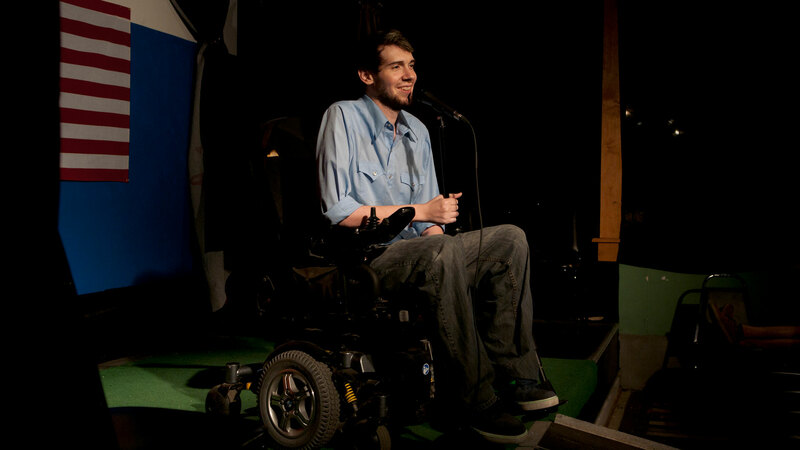 He leaves behind a legacy of comedy, visual art, and disability advocacy. From it’s fly-on-the-wall observational footage to its hand-crafted animation segments, the best thing about Hannah Engelson’s profile documentary Jonah Stands Up is how unpolished it feels. That might seem like backhanded praise, but in an online documentary landscape that is dominated by polish but seriously lacking in heart, Engelson’s film stands out. This definitely isn’t your highly refined profile doc, but, honestly, it’s kind of great that it isn’t. Those sort of shorts are a dime a dozen nowadays: slick, staff-picked, and forgettable. Rather, Engelson’s film feels all the more human because of its scrappy feel. It’s a terrific, honest exploration of a bright, funny guy, whose life was dominated by the shadow of his impending demise. It doesn’t seem like the stuff made for laughs, but Jonah, as a character, manages to straddle the line: funny and weird one minute, sad and existential the next. It’s the rare film that might make you both laugh out loud and cry over the course of its sixteen minutes. Operating mostly as a crew of one, Engelson’s small scale production was actually an asset, affording her the opportunity to capture moments that feel intimate and honest (such as the scene in the doctor’s office). We see Jonah at his silliest and most subversive, and also, his most vulnerable. Although it’s often the story setup for a bad Hollywood movie (i.e. what would you do if you knew you were going to die? ), the film never leans into the cliché beats you might expect. Rather, it earns its moments. After all, here is a young man who is facing death head on, and the quiet reserve which he handles that is inspiring. The result is a film that isn’t your typical inspirational documentary—the kind with soaring strings and generic soundbite platitudes. Bascle is too unique of an individual and Engelson’s approach is too personal to allow for that. Moreover, the film provides a window into the disabled experience in America. Engelson currently works as a freelance documentary filmmaker and cinematographer. You can find the link to her website below.